the booch: crisp and refreshing fermented kumbucha tea, originally uploaded by aarn! +5th May, 2009+. this is a mishmash of a recipe from the original scoby owner and a few recipes from various sources. brought 4Qt. of water almost to a boil. dissolved into the water 1/4c. of maple syrup (this culture had been fed with maple syrup before), and 3/4c. of dark brown sugar. steeped 4t. 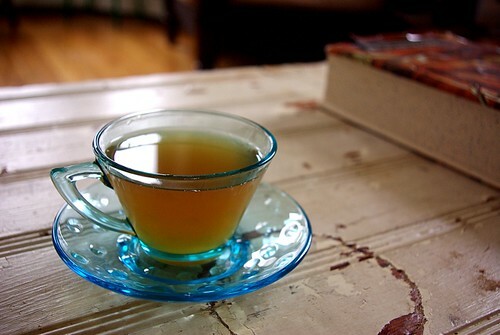 of mem tea's darjeeling blend in the water and sugar mixture for 15-minutes, strained the liquid into a large 4Qt. glass jar (with a loose fitting glass lid, to allow for a minimal amount of air circulation), and let cool to 90-degrees. when cool, the scoby (or mother or mushroom or whatever) was added, along with a little over a cup of the previous batch of fermented tea. the container was closed and left to sit in a dark cupboard for 8-days. the fermented product (less a cup or two to feed the next batch) was then transferred to a locking 4Qt. glass jar and placed in the refrigerator to keep. Great photo...Have you heard of Jun, by the way? Similar to kombucha but from Tibet/Nepal. Awesome site. Digging everything from the writing style to the pictures to the straightforward approach. Loves it. Just found your site through a link in 101 Cookbooks reaing the Sara Foster interview and I am hooked! Great ideas and beautiful photographs! Thank you!